This past fall, a friend of mine looked at this website and said something like, ” Are you actually trying to sell anything, because I can’t find it.” After my initial shock, I realized he was right. This site is more about explaining what I’m doing and how I’m doing it than getting my product into customers’ hands in an efficient way. So I began to think about what I needed to to to fix that. Make “My Little Shop” more visible. List more items for sale and spend more time taking better pictures and posting them. Use a totally different platform like Etsy or Shopify. None of these solutions appealed to me and I started to rethink the whole proposition of selling online. I have really enjoyed the personal contact I have with customers when I sell at craft fairs or farmers markets. I get to explain a bit about my work, and they get to tell me what they want. A lot of time this leads to special orders or new ideas for me of products I should develop. I love the back and forth and I look forward to fairs and market days. But selling online, though it seems like a more time efficient way to move products, doesn’t appeal to me so much. I find nothing exciting about receiving an order, packing it and sending it through the mail to a person I will probably never meet. So I got to wondering if somehow there was a middle ground. A way people could see what I have to offer online, but also have some contact with me as part of their order. This photo Gallery is my attempt at what I’m thinking of as “Slow Shopping, ” kind of like the Slow Food movement, but in retail. The idea is that if you find your way to this website, you can check out these pictures of things I have made, then contact me to tell me what you’re interested in. If I have it in stock, I’ll send it right out. But if not, then we get to have some back and forth about what you want, what color, who it’s for, if I have something similar, etc. The process forces both of us to interact just a bit, and I think that’s a good thing. So take a look, take your time, and let me know what catches your eye. Then hopefully I’ll be able to put my work in your hands and give it a little personal touch along the way. As I work my way through the next 6 months, finishing up my 25 years as a 1st Grade teacher, I am trying to make many transitions. My work identity will change from being a teacher in a public school to being a self employed artist creating hand printed fabric . I will shift from commuting to work to working mostly at home . I will go from spending my work days surrounded by 7 year olds to enjoying a mix of solitary work and interacting with customers. These are big changes, both exciting and terrifying. But I think the time is right for me to make this shift. As I go through the process, I will share my thoughts on retirement, art, craft fairs, and anything else that seems interesting to me. 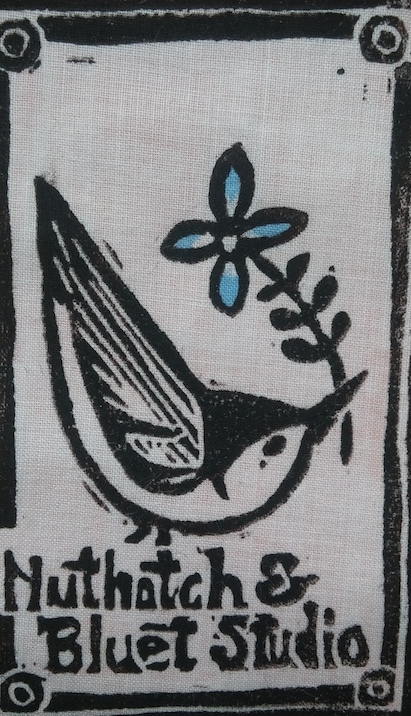 I hope you will check back from time to time to see how Nuthatch & Bluet Studio evolves.